As much as we, teachers, want our students to fall in love with the subjects we teach by getting them to relate to it via performance arts, experiments & projects. In reality, our students have to match up to only one criteria at the end of Form 5: paper excellence (aka Writing). I feel that the mere pursuit of this turns them into soulless regurgitators &, at the end of their exams, they will have no desire to hang on to what they have learned because it is meaningless to them. When teachers plan their lessons, they have to strike a balance between the robotic reality described above & the romance which makes us human & gives these robotic functions purpose. At the end of the day, no matter what teachers believe, if they really care for their students, they will be compelled to put their students in the best position to perform in the exams. A key part of this preparation is an Exam Talk. It should never be the one & only programme to prepare students for the exams but it has an integral part to play in any school’s exam excellence programme. Why are talks so important? So that every student is on the same page. Teachers will have emphasised & practised the necessary exam skills from the beginning of the year. However, it is important that students are reminded & given the best & most comprehensive advice just before the exams; so that none of them can complain that they weren't given everything. The best is if experts (GCs, examiners, experienced teachers, etc) were invited to do it. What if none of the experts want to come to your school? Perhaps your school is disadvantaged geographically (too far), financially (no honorarium) or prestige-wise (bad or no reputation). Guess what? My school has all 3 disadvantages &, true enough, NOBODY wants to come to my school to talk to my students. As a teacher in such a situation, what do I do? Do I follow in the footsteps of those before me & do nothing except point fingers at those selfish knowledge tyrants who didn't want to come? No excuse is every good enough for inaction. I decided many years ago that if they didn't want to come to me… Fine. I’ll go to them. Since 2010, I approached experienced teachers, examiners, any random contact that I had for information. It’s surprising how many teachers were willing to share & help me without any reward. For this, I have to give credit to the English teachers in Sibu. They played a big part in developing me into a knowledgeable teacher. The biggest teacher in Sarawak, Arthur Wee, played the biggest role because he was such a heavy personality with such a big bulk of knowledge. Thanks, mentor! Even though I was just a common inexperienced new teacher, I designed my own talks from what I have learned from the experts, books & online resources. I made myself a jaguh kampung expert for my students because the need was too great to merely sit around complaining while the students faced frustration & were unaware that they could do so much better. 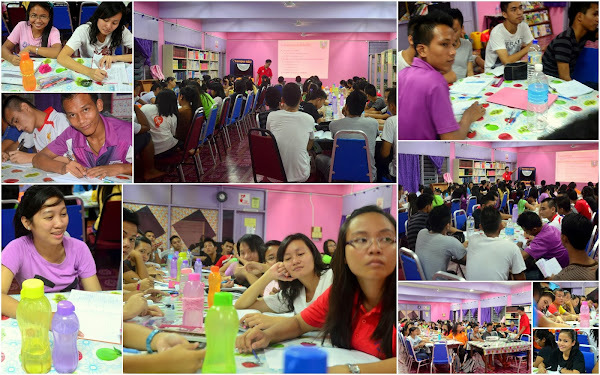 In 2011, I gathered up all my courage & gave a talk to all of my PMR students. Even though I was only in my 3rd year of teaching, it didn't matter because a talk from a well-read inexperienced teacher is still better than no talk at all. In 2012, I followed up with talks to BOTH my PMR & SPM students. I have done it again this year & I intend to keep on doing it year after year. To help my fellow teachers, I shared my PMR slides earlier this year. Since it is the final year for the exam, I wanted to let everybody have a chance to help their students perform at their best. This year, I was invited to give talks at schools but I turned them all down because my school’s need is greater than theirs. I’d rather devote my time here. There are plenty of experts out there who are not as needed by their students (schools with select students). Ask them. Or, better still, make YOURSELF a jaguh kampong expert & share your inspiring story with the world. It is easier than you think. View all the pictures of the PMR Talk here. View all the pictures of the SPM Talk here.